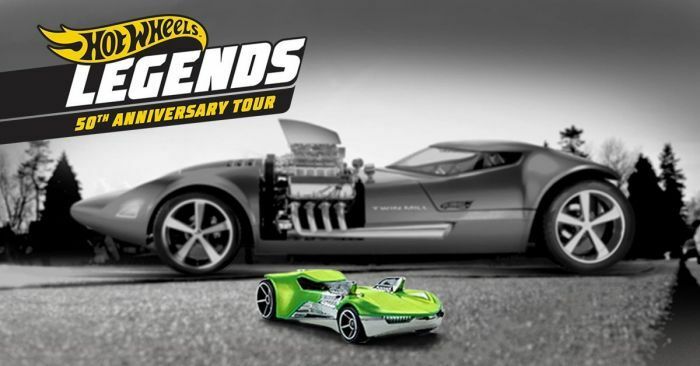 Mattel and Hot Wheels are launching a nationwide tour to find the 15 vehicles that deserve to be featured as Hot Wheels Legends. Does your car have what it takes to be immortalized as a legend? Mattel and Hot Wheels kicked off a cross-country tour this week-end to find vehicles that are so spectacular they deserve to be cast as the next Hot Wheels Legends. Jay Leno was even on hand with his 1957 Chevrolet Corvette to help the toy company launch the nationwide search. According to the company, when Hot Wheels selected the original “Sweet 16” die-cast cars in 1968, they selected some of the most influential and legendary cars in automotive history. Now, Mattel is conducting a contest to find custom cars worthy of joining them as Hot Wheels Legends. The contest is being held in conjunction with Walmart and the individual try-outs will be conducted at Walmart locations in 15 different cities. A finalist will be chosen from each of the 15 cities. The winners will join Hot Wheels at SEMA 2018 in Las Vegas, where one lucky winner will be immortalized as a Hot Wheels Legend and get made into a die-cast car sold around the world. e. Performance & Fun: 20%. The first event was held at the Hot Wheels Headquarters in Los Angeles, California. Fourteen more events will be held at Walmart locations between now and the end of October 2018. Find a full list of the competition sites and dates at Hotwheels.mattel.com. The winner from each location will win a trip to the world-renowned 2018 SEMA Auto Show, in Las Vegas, to be displayed at the Hot Wheels Legends Pavilion. Hot Wheels will unveil the “Sweet 16” finalists, as well as the new Hot Wheels “HW50” edition made exclusively to celebrate its 50th anniversary. They will also announce which one custom car will be immortalized as a Hot Wheels die-cast toy.